For successful energy management, consumption values of machines and systems must be known. 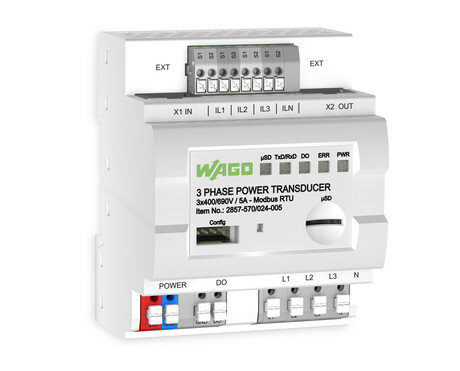 The WAGO 2857-570/024-00X 3-phase power signal conditioner in a DIN rail-mount enclosure offers a solution for measuring currents and voltages in a 3-phase supply network, remotely from the control level. Measured variables such as active, apparent and reactive power, energy consumption, power factor, phase angle and frequency can be accessed via a Modbus interface. Two integrated RJ-45 sockets streamline the interconnection of up to 32 devices. In addition, the 3-phase power signal conditioner can log the corresponding measured variables onto a microSD card. Simple configuration and display of measured variables using WAGO’s interface configuration software enable the user to perform comprehensive data analysis. Current is measured via current transformers or Rogowski coils, allowing flexibility of installation. 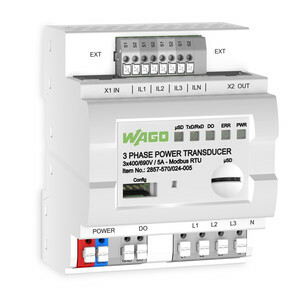 Other benefits include a slot for microSD cards for fast and secure mobile measurement, compact device in a DIN rail-mount enclosure which saves space, Modbus interface and a digital signal output as pulse output (configurable pulses/kWh) provides permanent energy consumption monitoring. I am interested in WAGO 3-phase Modbus RTU power signal conditioner .